Thyroid, Parathyroid, Adrenal, Endocrine Surgery, What is Medullary Cancer of the Thyroid? 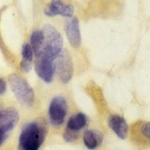 We have great concern because cases of medullary thyroid cancer that have been referred to us have rarely been treated adequately.This concern is echoed in the Audit of August 2007 by the British Association of Endocrine and Thyroid Surgeons (BAETS) which reported that in the UK in a 2 year period 62 cases of medullary thyroid cancer were treated by 27 surgeons, and when considering first operations for medullary thyroid cancer, 35 cases were treated by 21 surgeons. This indicates that few, if any surgeons in the UK were obtaining adequate experience in this form of thyroid cancer.The treatment of medullary thyroid cancer is so complex that consideration should be given to the BAETS nominating special centres for its treatment in the UK. It is therefore our view that if you are a patient with medullary thyroid cancer you are strongly advised to seek advice and treatment at a specialised centre. 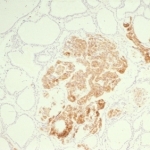 Much of the world literature reports dismal results of treatment in medullary thyroid cancer, but our own experience with careful management is that even with evidence of tumour spread that the disease is often quite indolent and the long term survival even with a persistent high calcitonin is good.In excess of 80% at ten years. 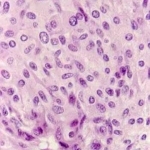 Medullary cancers arise from a group of cells within the thyroid called C cells, which produce a hormone called calcitonin.C cells do not concentrate iodine so radioactive radioactive iodine is of no value in the management.When there is an increase in the C cells (C cell hyperplasia) or if the C cells become cancerous (medullary thyroid cancer), large amounts of calcitonin are detectable in the blood. 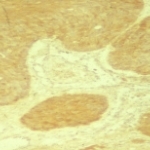 The calcitonin level acts as an indicator of cancer activity (it is a tumour marker, the higher the calcitonin the greater the tumour bulk). 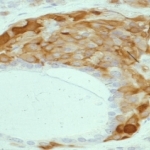 This tumour is not limited to humans; it occurs in bulls, cows, horses and rats. There are four types of medullary cancer.